Want to learn how to make seared scallops like a professional chef? 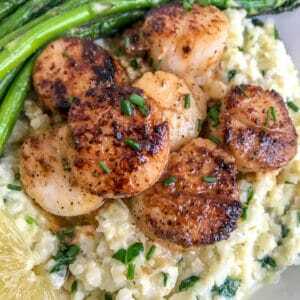 This Lemon Garlic Butter Scallops with Cauliflower Risotto recipe will give you a restaurant-style meal from the comfort of your own home and for much cheaper. One thing that I love to indulge in on date night out with my husband is a plate of seared scallops. To me, they are the ultimate treat. Especially for the price tag that generally comes attached to a scallops dish. And they only give you 3-4 scallops! Therefore, without question, I knew I needed to give home-seared scallops a spin myself. 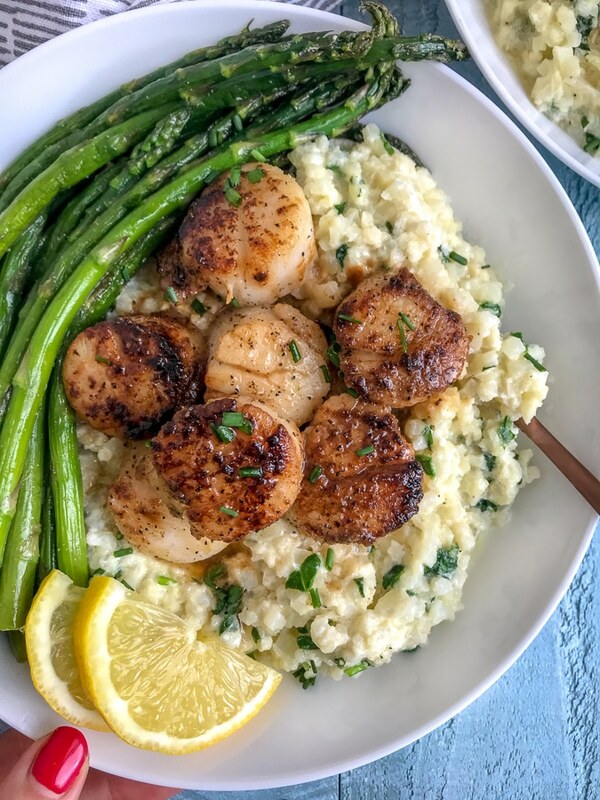 This Lemon Garlic Butter Scallops and Cauliflower Risotto dish is the bee’s knees. 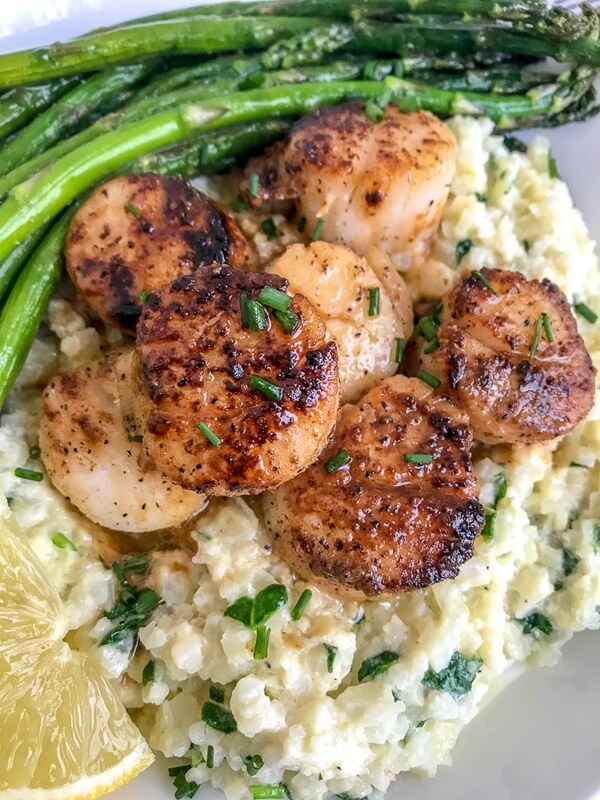 The scallops are seared to perfection with delicious garlic butter and lemon flavorings. 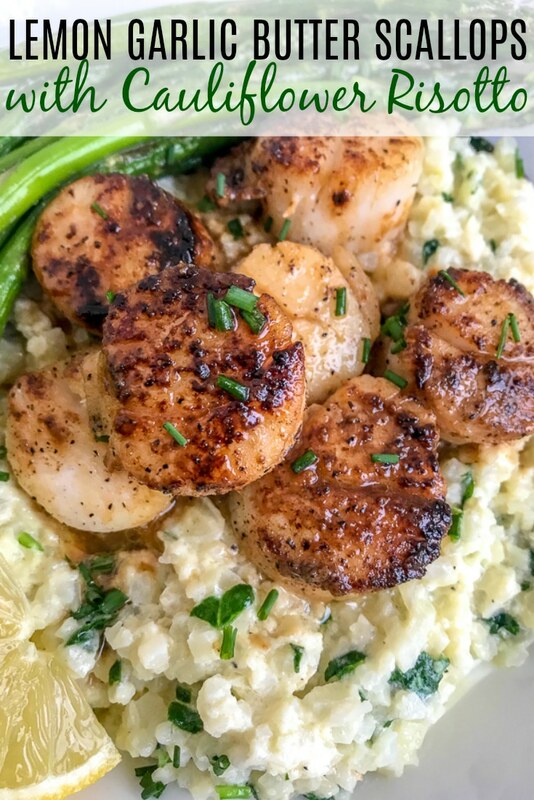 They pair exceptionally well with sautéed asparagus and this creamy Cauliflower Risotto. Because risotto is a date night treat out, too. Right?? Learn how to make that at home, as well, but on a lighter and lower-carb note by using cauliflower! The one thing I did not want to do was mess up the first time I bought and seared scallops. Why? Because they were $16-17 for a 1 pound bag at Trader Joe’s. With such a high price tag, the last thing you want to do is mess this up. Which sent me to watching several YouTube videos on how to properly cook them. I was amazed at how easy it would be! So I will be sharing the few tips I learned from random YouTube videos and my own trial and error with this recipe. Let me tell you – they came out perfect. I mean, let this close up picture of them be the judge! Crispy on the outside, tender on the inside, and bursting full of lemon garlic butter flavors. 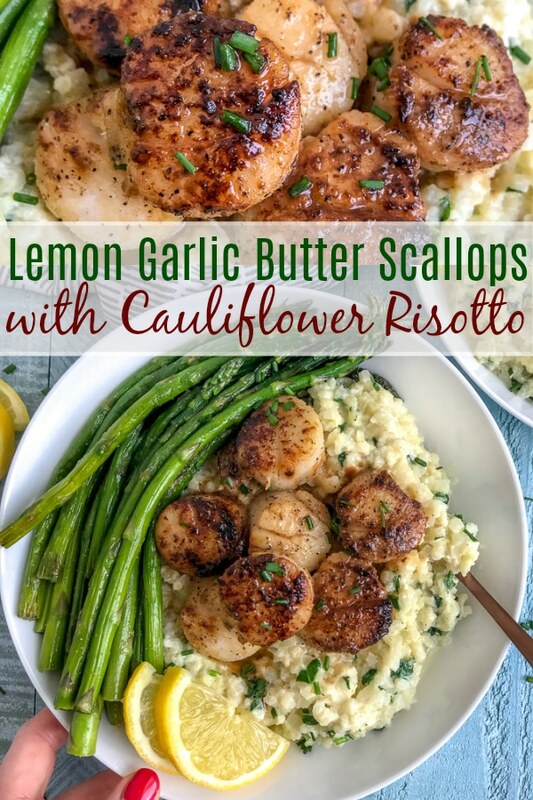 You will be in heaven with this Lemon Garlic Butter with Cauliflower Risotto dish! Jumbo scallops work best in my opinion, as they are easier to handle, hold more flavor, and easier to flip while searing. Aim for jumbo, if you can find them. Some prefer the roe still attached, but I am not a fan of the taste. If you can’t find them without, you can simply remove them prior to cooking. But if you can find frozen, wild-caught jumbo scallops without the roe – grab those! It’s important to thoroughly thaw the scallops overnight in the refrigerator before cooking them. The less moisture when they go in the pan – the better. When ready, place the scallops onto a few paper towels. Use additional paper towels to pat them dry. You want to remove as much moisture as possible. It is a little easier to place a scallop inside a dry paper towel and squeeze/press gently. 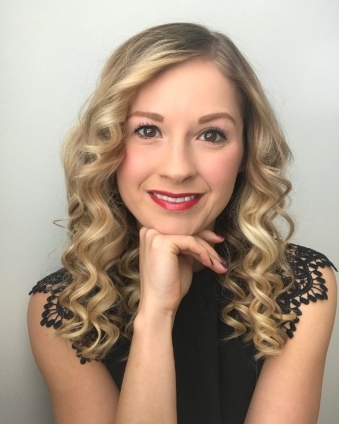 First things first – don’t be intimidated! It’s really quite simple and only takes 4-6 minutes to sear them. Heat the pan, add scallops, and flip. That’s it! Place a large cast iron skillet with oil (one with high smoke point) or butter over medium-high heat. Once the oil/butter is hot, add the seasoned scallops in one at a time, seasoned side down. The pan needs to be hot enough that it sizzles when you add the scallops. If they are not sizzling, the pan is not hot enough. Sear each side for 2-3 minutes. Easy peasy! 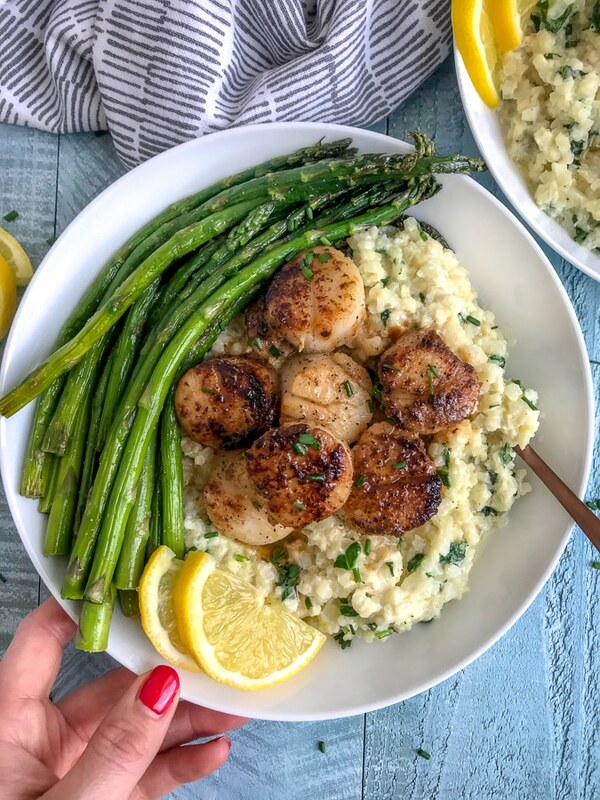 You can serve these seared scallops with the Cauliflower Risotto and sautéed asparagus, or swap things out for your favorite sides! The options are endless! Get creative or do what fits your dietary preferences. 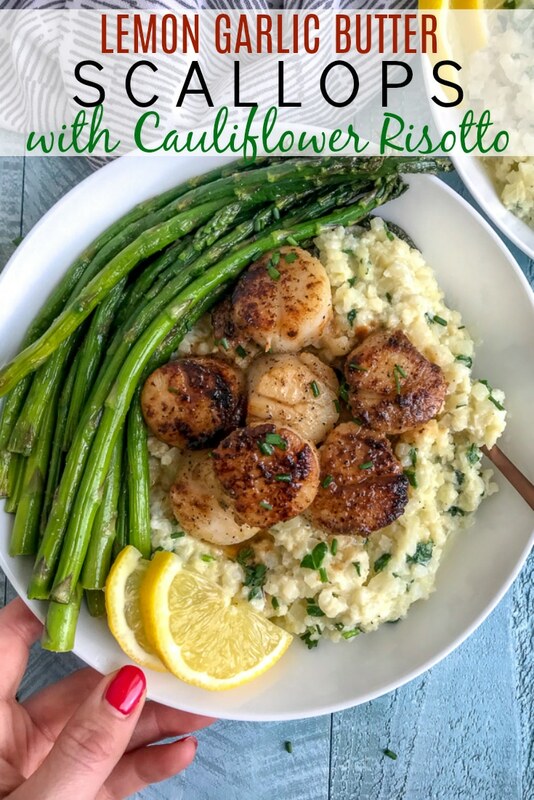 You can also get creative with what you add to the cauliflower risotto! This recipe calls for baby spinach and onion, but you can swap it out for peas, sliced mushrooms, bell peppers, sun-dried tomatoes – your choice! Guaranteed to be delicious. Learn to make perfectly seared scallops like a chef! Cheaper than dining out, easier to make than you think, and they come together in under 10 minutes! Pair it with sautéed asparagus and cauliflower risotto for an incredible combination. Place a large, nonstick pan over medium heat with olive oil. Once heated, add the asparagus in a single layer. You may need to work in batches. Season with salt and pepper, to taste. Sauté 8-10 minutes, checking for desired tenderness with a fork. Place a large nonstick pan over medium-high heat with butter. Once butter has melted and is bubbling, add the chopped onions. Sauté 3-4 minutes, or until translucent. Add minced garlic and sauté for 30 seconds. Add cauliflower rice, stir, and cook for 3-4 minutes. Pour in the half and half and stir. Add the mascarpone and stir until melted. Add the parmesan cheese, salt and pepper (to taste). Cook, stirring, for 3-5 minutes to allow the risotto to thicken a bit. Add the chopped spinach, stirring for 1-2 minutes, or until the spinach has wilted. You will want to wait until the sauce thickens a bit before adding the spinach. Line scallops up on a paper towel and pat them dry - firmly but gently. You want to remove as much water as you can. This helps to crisp the outside of the scallops. I find it's easier to line them up on a paper towel to dry. Grab one and wrap it in another paper towel in your hand and gently apply a little pressure. You do not want to squeeze too hard. Place a large cast iron skillet (or nonstick skillet) over medium-high heat with the butter. Season the tops of the scallops with salt, pepper, and garlic powder as they rest on the paper towel. Alternatively, you can add minced garlic to the sizzling butter for garlic butter flavoring if you do not have garlic powder. Once the butter is bubbling and starting to brown, add the scallops one at a time using tongs. Place seasoned side down. The key is to have them sizzle/crackle when added to the pan. If they are not, remove and increase the heat slightly. Your pan needs to be hotter. Sear for 2-3 minutes, seasoning the opposite side with salt, pepper, and garlic powder. Squeeze 1/2-1 full lemon over the tops. The amount of lemon juice will depend on how much lemon flavoring you prefer. I used 1/2 a large lemon. Flip and sear for another 2 minutes. Remove from heat and serve promptly. 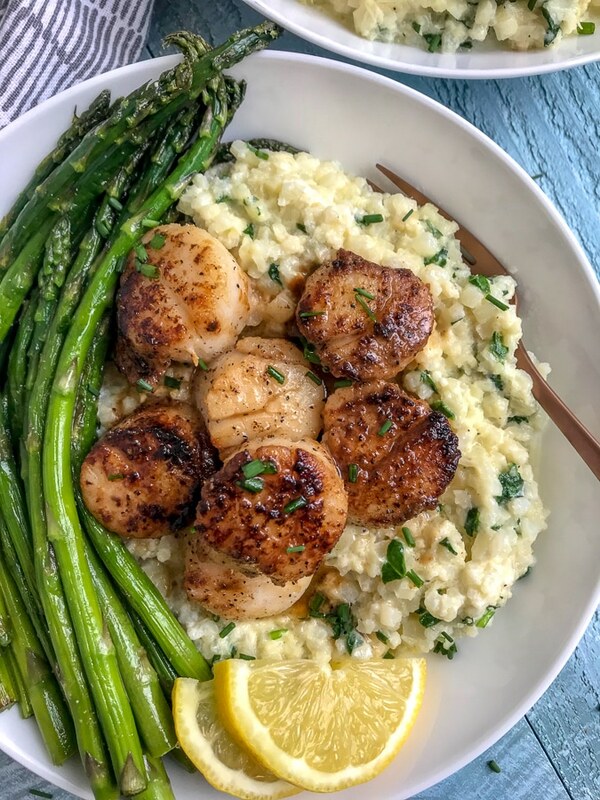 Serve with sautéed asparagus over cauliflower risotto - garnished with freshly chopped chives and don't forget to spoon some leftover butter from the skillet over the top! SODIUM: Scallops are naturally salty. I recommend searing in unsalted butter and seasoning very lightly with salt (if preferred). You may want to try searing them without salt FIRST and see how you like them. RISOTTO: If the risotto is not thickening up, I recommend adding an additional tablespoon (making 4 tbsp total) of mascarpone or additional parmesan cheese. Allow it to simmer a bit before adding. It may take time to thicken. OIL/BUTTER: If you prefer to sear in oil, I recommend using an oil that has a high smoke point, such as grapeseed oil or avocado oil. GARLIC AND LEMON FLAVORINGS: Feel free to add more than 1/2 teaspoon of garlic powder or more than 1/2 of a lemon squeezed to increase the flavorings. Each taste profile is different!